We don’t have easy access to a grill, so I always appreciate oven and stove-top alternatives for grilling and barbecue. The Glen-Mor Restaurant prepared the Barbecued Half Chicken in the oven as follows. Make the Barbecue Sauce homemade – it is worth it. 1 whole chicken, approximately 4 lbs. Preheat oven to 350 degrees-F. Cut chicken in half down the breast bone. Place chicken halves breast side up on a large roasting pan. Baste in 1/2 cup Barbecue Sauce. Roast chicken covered with roasting pan top or aluminum foil for 1 hour. 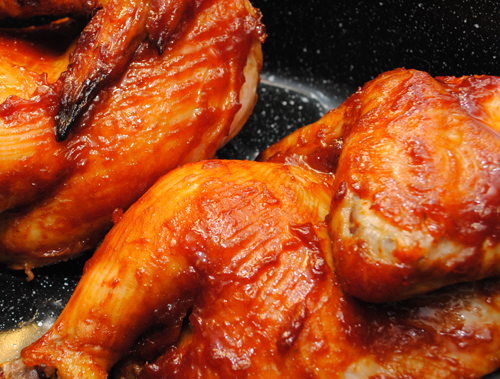 Remove chicken from oven, remove cover, baste with additional 1/2 cup of Barbecue Sauce. Return to oven until chicken is done, approximately 30 minutes. Warm remaining 1 cup of Barbecue Sauce over the stove. Serve chicken with side dish of Barbecue Sauce. For large portions, serve each portion one half chicken – as was done at the Glen-Mor Restaurant. Alternately, cut the chicken halves to serve 4 people.